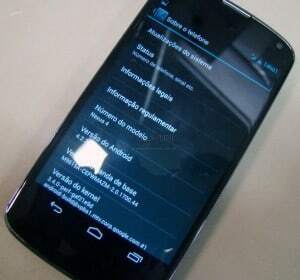 The First Nexus 4 with Android 4.2.2 in Brazil? A Brazilian website is letting us believe that Android 4.2.2 is already finding its place on Nexus 4 devices produced in Brazil. How come? Well, apparently, LG has began manufacturing Nexus 4 devices in Brazil starting with January 5, and supposedly they are stacking them up with Android 4.2.2. If you think about it, it makes sense, manufacturing the devices with the latest Android installed. But is the picture the Brazilian website released really a true one? It looks very much like a fake, and also it is very easy to change the build.prop file to show Android 4.2.2 in the About menu. As you can see in the image, the reflection is conveniently covering the Android version area. Maybe it’s real or maybe it is not. Anyway it does make sense to already start pushing Android 4.2.2 on some devices, because the 4.2.1 version still has a lot of issues and bugs that need to be fixed. What do you think, fake or real?